On Wednesday, Maggie Rogers shared a new music video—which she directed with Alan Del Rio Ortiz—for her recent single “Give A Little,” a contagious, hooky pop tune. 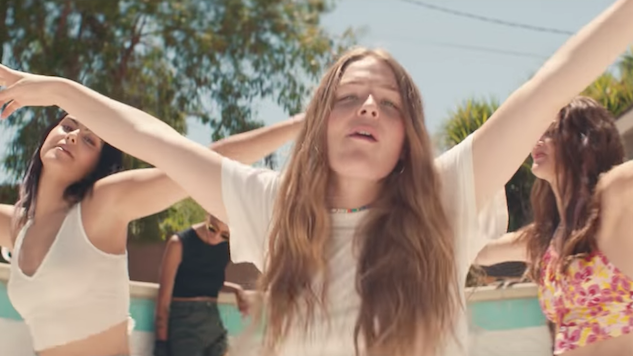 She rounded up two of her best friends from college, perfected some Haim-esque choreography and made one of the sunniest music videos we’ve seen so far this summer. Watch it below. I had so much fun directing this video alongside Alan Del Rio Ortiz. I was obsessed with 70s skate culture in high school and really just wanted to have a silly day recreating my favorite scenes from Lords of Dogtown and paying homage to my favorite Farrah Fawcett photos. Those early skate videos feel so raw and powerful, it was important to me to show that that energy could also be female. It was super special to have my two college pals, Rachel Matthews and Camila Mendes, along for the ride. We’ve been friends since the first week of our freshman year, but our schedules have gotten so beautifully and amazingly kind of crazy since we graduated a couple years ago. It was so much fun just to spend the day dancing and giggling with each other like the old days. Earlier this summer, Rogers shared the video for “Fallingwater,” another recent track. Watch that clip here and find Rogers’ tour dates here.